12v @heater blower motor, but still doesn't work. I have 12 volts at the blower motor harness ofa 1997 mercury mystique, about 160k miles on it. I have a new blower motor, new resister, and swapped the relays. Can I have 12v at the connector and be missing the current to move the motor? Motors need ground too or nothing is going to happen. If testing by common test light check with empowering lead with bat+ then what you test is in fact ground - got that? IDK specific car but some motor bodies (assorted) must be grounded thru a fastener that holds them is ground? As you can see if you know how to read a diagram. The ground side of the circuit goes through the resister and switch to control the speeds so you need a test light that can show you ground and test to see if the ground signal is coming from the switch and arriving at the resister. Thanks for the reply. I have good ground and when I put a meter on the blower motor on 2 pin connector, one lead on black the red lead in the 12v in, I get 12v. If the ground was faulty would I still be getting 12v? I have tested all grounds and tested for continuity and shorts to ground across all wires in the schematic. No you haven't. You don't seem to have any understanding of electrical circuits so you will likely need t pay someone locally to diagnose this for you. I'm gonna go get a tester light, but I do have a meter and used that for years an aviation electronics technician. I feel I'm pretty good at reading schematics and shooting wires. Everything looks good and reads out good but the blower will not work. I'm missing something g I'm certain of it. Both motors will spin if hooked up to a 12v cordless drill battery. I'll look today to see if the motor needs to be housing to work in car. It didn't need to when running by direct to drill battery. Hammer time, I am not an expert but I did 15 years as an aviation electronics technician. Didn't deal with motors and relays to much, I was a communication, navigation, radar, and weapons systems., I'm pretty savvy with interpreting schematics, some of my electronics background is rusty. If I doing something incorrect I'm listening. I isolated the circuits in the car, removed relays, tested all grounds, tested pin to pin, i get 12v on relay, (hot all time). I am pretty sure the relay isn't switching. which has me confused cause I have 12v at blower pin connectot. I can't find an issue. And that is my whole point. 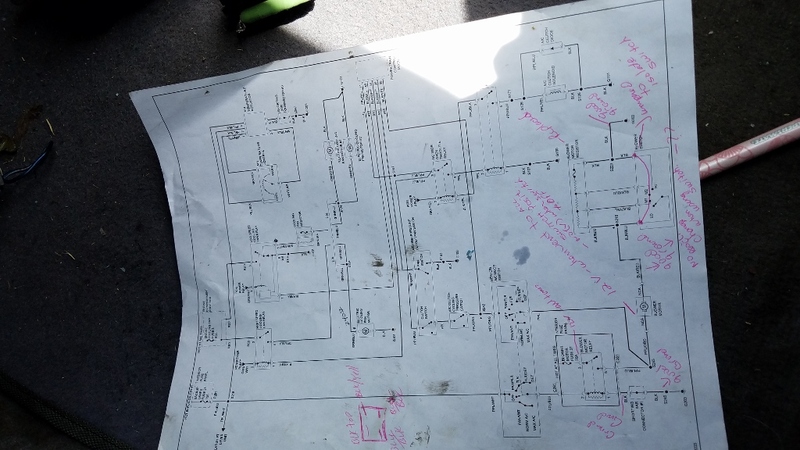 I gave you all the info you need to diagnose this circuit and I even told you what area the problem will be in but you are not understanding this circuit at all. The speeds are controlled through the ground side of the circuit. You stated you have your leads across the blower motor's connector? Are you checking this with the connector unplugged or are you back probing the connector with it plugged in. I almost never check a circuit by opening it up because high resistance in a a circuit can give you a false reading. 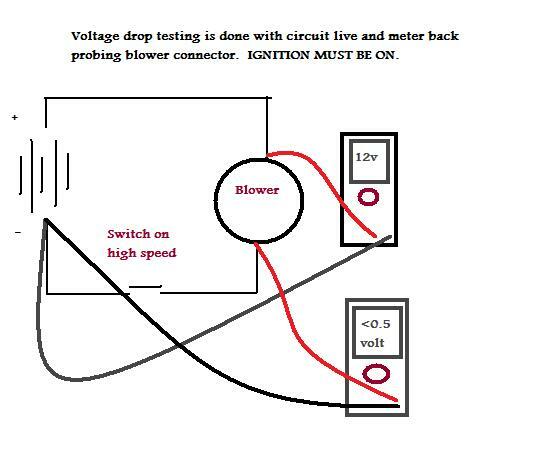 The best method is to back probe the connector with your meter lead or back probing tool when the circuit operational. You want to check the circuit live because then you can detect voltage drops that you won't see if you open the circuit up. If you have the connector unplugged you might see 12 volts across it, but when you plug it in and have the circuit working, it is possible that the voltage will drop if you have excessive resistance going on. 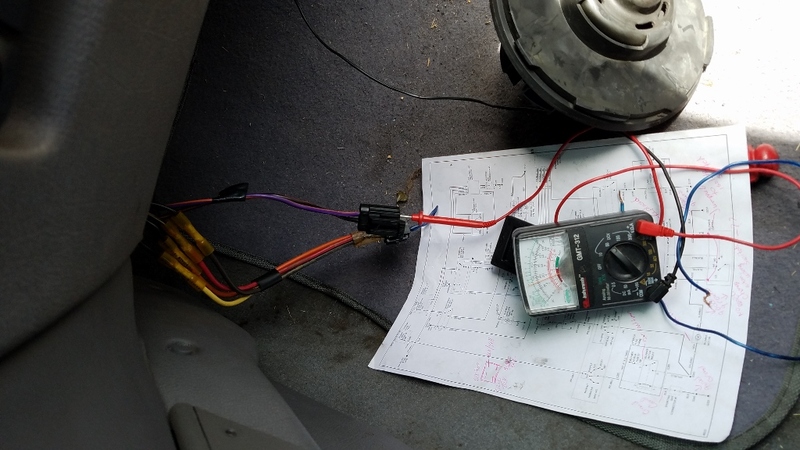 Take your black meter lead and connect it to a known good ground. ( The vehicle negative post of the battery is the best ground). Use your red lead and back probe each side of the blower motor connector. You should see battery voltage on the wire that comes from the blower relay and near zero volts on the wire that goes to ground through the blower switch with the blower speed setting on high. Measure those two wires with it plugged into the blower at the blower motor connector and the blower speed on high and let us know your readings. Discrete, thanks for info. I may be on to something. With motor hooked up, the load indicates 0 v.
Check out my two pics as they contain my reading not hooked up and my schematic that I am taking notes on with readings. I have isolated all circuits while taking readings, pin to pin, shorts to ground, and shorts to surrounding pins. With switch turned to vent and back to off, the 12v (not hooked up to motor) comes and goes. This tells me the switch is working. I also bypassed the lo-hi switch with a jumper and the position switch with a jumper. No luck. I have also jumped the resistor too. Is there a chance, my original motor is bad, and the one I got from pepboys has some winding issues that drop the voltage to much? Here is a marked up schematic too. 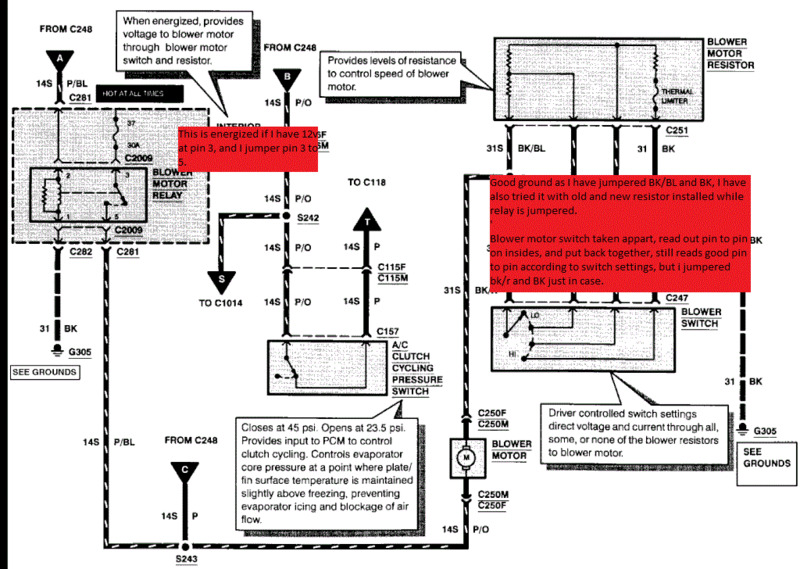 Can the wiring going to the temperature switch play a role in the motor not working? I removed the fan relay from schematic by jumpering pin 3 and 5. Hammers marked up schematic. Also, all ground readings are 0ohms, no high resistance readings at all. I understand that 0 ohms can be made by a small strand of wire still making a good ground, but since I don't have a meger, than I have no real way of testing the grounds any better than a multi-meter. I am leaning towards a faulty "new" motor, but like I said, I hook it up to a battery and it sparks and jolts a bit. Don't have a good connector set-up to do more than a quick short and the motor spins. I realize I am missing something, but I cannot for the life of me pin point it. You jumpered Bk/r to BK. How do you know BK is a good ground? If you have 12 volts on one side of the motor and you have close to 0 volts on the ground side of the motor with the circuit operational, I'd say your motor is faulty. If you have 12 volts on one side and 12 volts on the other of the motor, than you have a grounding issue. 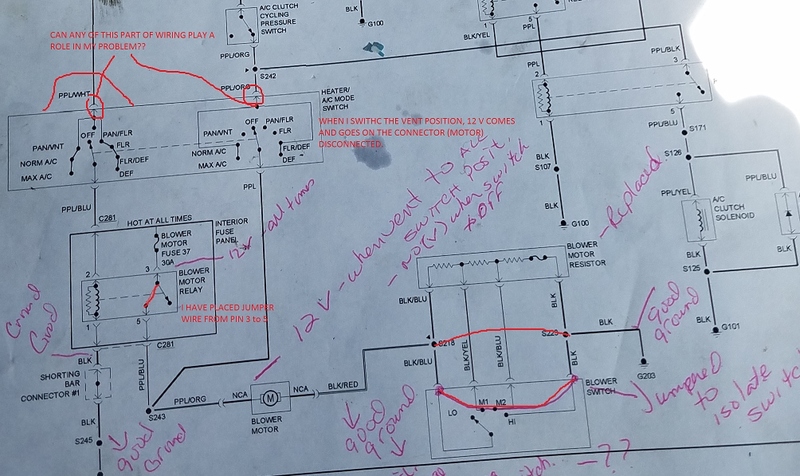 If you ran a jumper from ground directly to the motor's ground and you still had 12 volts on the power side, that would definitely tell you the motor is junk if it still didn't run, as long as the terminals are not all burned up in the connector. It could if it was the ground side of the circuit that dropped out but it doesn't sound like you have determined that yet. I will do this test tomorrow. I will provide readings, across the motor hooked up and on each side. Everything indicates a bad motor because my daughter was experience a lugging original motor, that would intermittently work. Then finally went out. Could be a fault wire as I am reading there is a lot of heat generated on these power lines.